An affogato is an Italian dessert where a fresh shot of espresso is poured over a small scoop of ice cream. It’s a perfect melding of hot and cold for a coffee-lover. I usually make these with vanilla ice cream or gelato because vanilla and coffee is always a winning combination in my book. That said, you can really use any kind of ice cream that you think will work well with your shot. I would stay away from ice cream with big chunks in it (such as chunks of cookie dough), but other than that, there are many options. 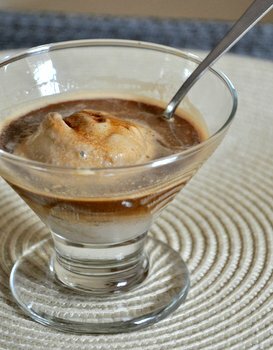 This Double Coffee Affogato is for coffee lovers. It starts with coffee ice cream and is topped with espresso. 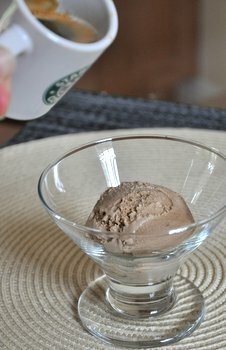 You can buy the coffee ice cream – mocha would be a good choice, too – or use homemade. I opted to use my homemade Cafe Latte Ice Cream, increasing the coffee to two tablespoons for a stronger flavor. If you are using store-bought ice cream, pick a high quality brand like Haagen Dazs (they make my favorite coffee ice cream). This recipe is for one serving, but you can make as many servings as you have ice cream for. To prep in advance, scoop the balls of ice cream onto a baking sheet and freeze them, then pop them into glasses before serving. Place scoop of ice cream into a small dessert cup or bowl. Pour hot espresso shot over the top and serve immediately.